These days, everyone knows Patsy. But Copas and Hawkins are far less known. Lloys "Cowboy" Copas, an Ohio native first achieved stardom in the 1940s when he replaced Eddie Arnold in Pee Wee King's band. (I just played one of his hits, "Hangman's Boogie" on my latest Big Enchilada podcast.) Copas began his solo recording career King Records in Cincinnati. That influential label in 1948 also signed long tall Harold Franklin Hawkins, better known as "Hawkshaw." Hawkins. whose wife was country singer Jean Shepard, began singing professionally after World War II. (An Army vet, Hawkins fought in the Battle of the Bulge.) Like Copas and Cline, he was a member of the Grand Old Opry. I probably don't need to tell you about Patsy. At the time of her death she was one of the biggest stars of country music. At the time of the crash, the three were returning from a benefit concert in Kansas City -- a show to raise money for the family of a disc jockey who had died a few months earlier. Also killed in the crash was the pilot, Randy Hughes, who was Cline's manager and Copas' father-in-law. 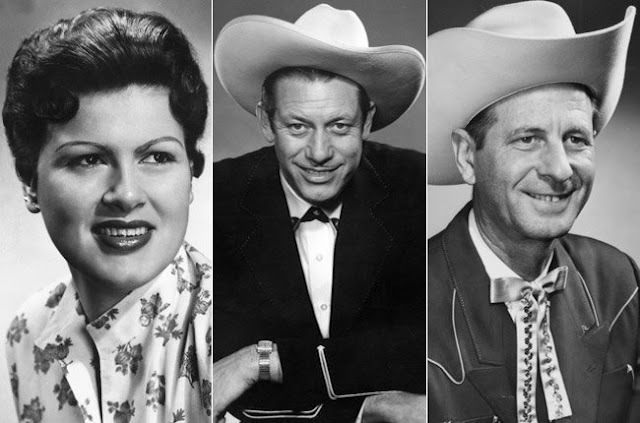 But first enjoy some music from these three country greats. We're fortunate that YouTube has live clips from all three. Here's Cowboy Copas.